I have to be honest. While I do feel I've been focusing on all things positive during this journey, I have to admit there has been a constant, nagging, negative thought in the depths of the back of my mind. I mean, really, my newborn son is going to have open-heart surgery a few days after he's born. There IS -- as much as I choose not to think about it -- a chance that we will not be bringing him home, that God will choose to heal him forever by taking him home to spend eternity with our Heavenly Father. Regardless of how much I hope and pray that Chase will exceed our expectations with his recovery or that God will provide a miracle by healing his heart before he's born, I do have to constantly push the one negative thought out of my mind. God gave me His peace with this pregnancy from the very beginning. When we got the news of his HLHS diagnosis at 20 weeks, God's peace continued to dwell in my heart. I am fully trusting in Him to see us through this journey, whatever the outcome. Since I am admitting to having this one negative thought, I will also add that this one thought has kept me from doing much of anything to prepare Chase's room for when we come home. I mean, we purchased his convertible crib and dresser a few weeks before we got the diagnosis. But I've been in no hurry to do anything to get his nursery ready. It's that one nagging thought that's been keeping me from it! Plus, I reasoned, God-willing we bring our sweet boy home, he'll probably sleep in his Pack n' Play in our bedroom for a few months before moving into his room. So I'd still have plenty of time to set it up when we get home. I guess God has been convicting me of allowing this one negative thought to remain in the back of my mind. I truly feel He is asking me to rely solely on Him, His peace, and His promise to see us through. I believe He wants me to live a FEARLESS life, regardless of the circumstances I find myself in. He is helping me grow through all of this and is making Himself known to me in ways I've never experienced before. I'm so grateful for His love, His promise and His blessings in my life. A few weeks ago, my fantabulous Uncle Darryl was in town to lead a revival at my church. He is one gifted man of God! While he was here, he gave hubs and I a small plaque to take with us to Charleston and hang up somewhere where we'll see it often. It simply references 2 Corinthians 5:7. Well, I've decided to embrace walking by faith, not by sight. To trust in God and His peace, rather than allow negative thoughts to permeate my mind. I truly believe this is what God wants for me as He's preparing my heart and mind for the journey that lies ahead. My first step in walking by faith? Preparing Chase's room for our return home. Hubs had put the crib together a few weeks ago, so I went ahead and laid out his bedding (it hasn't been washed yet, since I know it's pointless to do so now since he won't be in it for several months). I set up his dresser, cleaned out the drawers and put liner down. I've sorted through the clothing, blankets, towels, gifts, etc. we've received and finally washed a load of his things to take with us to Charleston. I've even packed a few things in his diaper bag. See for yourself! Overall, I know God will be walking with us through all of this -- most likely carrying us at times -- and I believe it's my responsibility to continue to keep my trust in Him, to believe in the peace He's given and to walk by faith, not by sight. "Thank you, Lord, for all You are showing me and teaching me right now. All of my faith and trust are in You alone. Amen." The room looks adorable and you are such an encouragement! I continue to pray that Chase makes it home safe and sound to enjoy his new room and precious family! 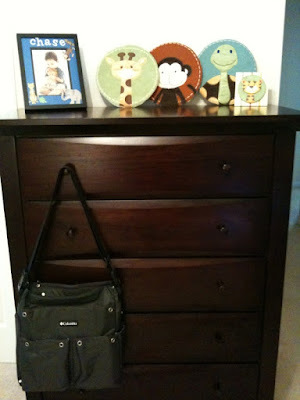 By the way, love the diaper bag? Where is it from?? Haha, can't you see me copying your diaper bag again?? I got a Pottery Barn messenger style bag -- red -- from a consignment sale and really like it, but I'm sure I'll want to switch to something smaller after a few months. Its cute! 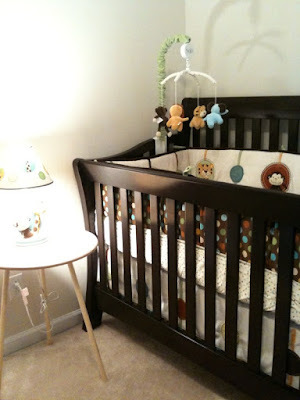 I'm so glad you put Chase's room together! All I can think of when I read this is the words to that Jeremy Camp song "I Still Believe".....Even when I don't see, I still believe! You are so strong--I am praying for you to deliver a happy and healthy boy who is healed of his heart condition with the extreme and careful care of Chase's medical team. I am so happy you are getting his room ready at home, even if he can't enjoy it immediately.